For me, the fill in the blank is read, gone for a walk (save for extreme weather conditions, my dogs wouldn't allow otherwise), observed nature, drank enough water, savored tea, not spent too much precious time surfing mindlessly online and watching television, and listened to some soothing music, like classical, or uplifting, like French. Consider what your fill in the blank moments are. I love the passage from Rococo as a reminder that waking up with mother nature (and being disconnected) feels healthy for my mind, body and soul. To me, it's about the tone you are setting for the day. Checking e-mail or watching the news (or looking at it online) never feels like a good way to start my day. Nor does time online feel like a good way to end it. A cup of herbal tea does, as well as a page or two from a book if that's all this tired mom of a baby and thee-year-old can manage. Sometimes I don't even accomplish that. There are nights I'm too exhausted to brew the tea and just want restful sleep. I have never been failed to be cheered when I visit a library or bookshop, although a library is more frugal for our one-income family. Fred warned Ricky in the I Love Lucy episode, "Lucy Gets a Paris Gown," that letting Ethel and Lucy go to a Parisian fashion show was like taking two mice on a tour of a cheese factory. In a book shop, I'm in the "mice in the cheese factory" territory, although I still support my local bookseller when I can. But I digress. Part of why I read is not just the story, but that feeling when your soul is stirred by a passage that will always stay with you - is now in fact a piece of you. Storytellers continue to remind me of what makes me feel most alive: time spent in nature and being connected to the earth, traveling and experiencing new things, savoring the seasons, the beauty of simplicity, eating well and eating of the garden's bounty. With two little ones and two dogs all wanting a piece of my attention throughout the day, I haven't been able to find the combined time, energy, desire and inspiration to do much writing. So many posts have ended up in the writing graveyard. However, I couldn't let my memories of last year's storytellers fade away, and I think it's fitting to remember them on St. Patrick's Day. Far from a drinking holiday, I remember on this day a country I visited in my twenties and what I loved about it: its majestic natural beauty, castles, tea, cozy pubs, warm, friendly people, and above all the great storytelling through both written form and song. Today, I celebrate authors here and their legacy to us all, their words that shape our lives. An Irish storyteller, Alice Taylor, makes my list for both last year and this year. Traveling is something that has shaped my life so, for just a few days spent in a location still stays with me years later. I still daydream often about the West. Maybe you're like me and your circumstances don't allow big vacations at the moment. But looking over photos to include here I find how restorative and underrated even the humble day trip is, like our autumn outing to New Paltz, New York, where we picked a farm by chance, this time Dressel Farms, to pick apples and zinnias, followed by a dinner at the Mountain Brauhaus in Gardiner, New York, a wonderful recommendation of a friend. The farm and restaurant were both new places to us, and you don't need a plane ticket to experience the new. Local apple cider with the best pretzel Steve and I have ever eaten on the cheerful patio of the Mountain Brauhaus while we waited for our table. Note the small flowers on the table in what looks like a salt or pepper shaker. I've given away so many of our vases, keeping just a few, mostly from my grandmother. Whenever I have flowers, really I like a simple thing like a mason jar to showcase mother nature's beauty. The older I get, the more I'm drawn to simplicity. Who says German food is all beer and bratwurst? German sparkling mineral water and their vegan special that day, a roasted carnival squash with farro, corn, tomatoes, and mushrooms in a parsley lemon pesto sauce. 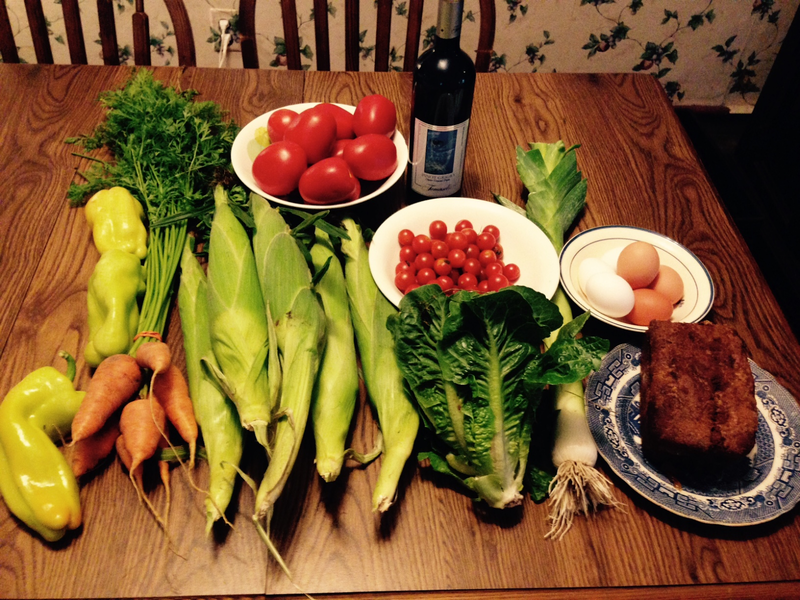 This was like someone went into their garden and picked its bounty. How good it does a body and soul to eat plant foods like this. The ratatouille at La Rivage in New York City, my bit of France for my fortieth birthday, followed by a trip to see "An American in Paris" on Broadway when it was still in production. To me, my love affair with French things is about having a love affair with life itself, and like the tone of my day Rococo reminded me of, I wanted this to be the tone for the years ahead for my life. At age 41 now, I'm still striving for better habits for myself, and like most everyone, I'm a work in progress. Paris was the first big vacation Steve and I took together, but I almost wish a more matured me visited the city. I'd love to take Grace and Pearl there one day, to go back to Versailles to see the gardens (it poured the day we were there) and take a trip to Monet's Giverny. For now, it is armchair traveling via films, books and social media for me. "Emma fussed with the cinnamon-rose starts she had planted all over the backyard. She was as tender with the roses as if they were her children, and every hour or two she watered them." - The Chili Queen by Sandra Dallas. This is my fifth Sandra Dallas novel, and I love this writer of historical novels set in the West. My mother and I both feel at times as though we lived in earlier time. Why are we so drawn to them? I'm not nostalgic for outdoor plumbing or primitive medical care, certainly. Geraniums are my flower children, and my botanical portal to the past. I envision my grandmother on the other end. Spring each year means the anticipation of daffodils, pansies, new growth hidden and thriving under the darkness in my garden, and the New York Botanical Garden's annual orchid show. Here from the 2016 show. Summertime peaches at Demarest Farm in Hillsdale, New Jersey. So many people in my area have fond recollections of Van Riper's farm in Montvale from their childhood, as do I. It is long shuttered, but it's funny it still pulls at so many memory strings. I love visiting family farms all four seasons. Blackberries from a roadside stand on a summer visit a few years ago to Lake George, New York, although when I remember blackberries they transport me so often to lush Washington state. Nature's artistry, indeed. "Her ashes are scattered under the oak tree in the southernmost farm fields. Louise remembered that tree from the tour with Laurent - firmly planted, ancient, maybe even wise, reaching for the sky. It seemed a tree that would share the secrets of the universe if one sat underneath its branches long enough, like the stories of the Buddha she'd heard in Sunday school as a kid." - After the Ballet by Jessica Rosevear Fox, a short story about two sisters, one a retired ballerina, traveling to a lavender farm they unexpectedly inherited in Provence. It's so worth seeking out the lesser known authors like J.J. Brown and Jessica Rosevear Fox who are making great art with their words. If trees could talk. Washington stayed here at the Steuben House in Hackensack, New Jersey. "The family took all the seeds from the garden and then they buried Nokomis there, deeply, wrapped in her blanket with gifts and tobacco for the spirit world. They buried her simply. There was no stone, no grave house, nothing to mark where she lay except the exuberant and drying growth of her garden. I do not need a marker of my passage, for my creator knows where I am. I do not want anyone to cry. I lived a good life, my hair turned to snow, I saw my great grandchildren, I grew my garden. That is all.” - Makoons by Louise Erdrich. While I cannot wait to share Laura Ingalls Wilder's Little House series with my daughters, I also plan to share with them Erdrich's Birchbark series following an Ojibwa tribe in the 1800s roughly about the same time Wilder's stories take place. Pictured here is an eighteenth century tavern garden recreated at the Bergen County Historical Society in Hackensack, New Jersey. 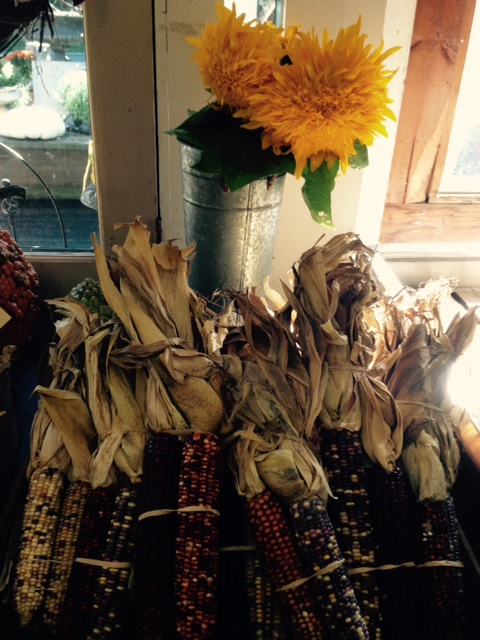 Nokomis so cherished her seeds. Gardening is something I want my daughters to learn about. Grace still remembers when she picked tomatoes at the New York Botanical Garden's family garden in the fall. She loves looking at pictures of her putting cherry tomatoes in a brown bag. I hope the seeds have been planted in her young mind. "This is not your land," William Lobb said. "Oh, it is, it is. I got the papers. I can show you, back at the camp." "This is Indian land, if it's anyone's." William Lobb spoke as if he hadn't heard Billie Lapham. "Those Miwoks encamped just south of here - they've been here longer than you. It's theirs, or it's God's land - take your pick.” - At the Edge of the Orchard by Tracy Chevalier, a dark look at frontier life in Ohio, then moving the story on to California amidst the Gold Rush. At the Ramapough Powwow in Ringwood, New Jersey, in October. I feel very connected to Native American culture because of their own connection to the land. "No - the stars are close and dear and I have joined the brotherhood of the worlds. And everything's holy - everything, even me." - The Grapes of Wrath by John Steinbeck. I started reading Steinbeck later in life, East of Eden many years ago and more recently Mice of Men, Cannery Row and The Pearl. Cannery Row has been my favorite so far. But I love Steinbeck's passage here in finding the holiness in all things. Finding my greatest spiritual connections in nature and gardens, here at the New York Botanical Garden, my favorite place in all of New York. "I use the good china because the world is huge and full of pain and loss; if a plate cracks or a teacup shatters, no one is harmed. What’s the point of life if the good stuff always stays locked away, safe and forbidden? When something beautiful finds its way to you, you must incorporate its beauty into your life, even if that means you risk losing it." Bravo, Sarah. You sound like a kindred spirit, an old soul. "In her mind she could remember about six different tunes from the pieces of his [Mozart's] she had heard. A few of them were kind of quick and tinkling, and another was like that smell in springtime after a rain. But they all made her somehow sad and excited at the same time. While I have so much to learn about it, all I know it that putting on classical music stills my soul, like this autumn rose at the New York Botanical Garden. "While living next to Mariage Freres, I fell in love with drinking tea. There's just something luxurious about sipping a fragrant tea from a faraway land." - Bright Lights Paris (Shop, Dine and Live...Parisian Style) by Angie Niles. How many coffee table books do we ever really flip through? Hardly any here, which is why I gave the majority of mine away. I think of this visually stunning book as a more compact, accessible book than those bulky behemoths that just collect dust. Just looking at it for a few moments whisks me away to Paris. Niles wrote about tea in "The French Art of Tea" section as well as finding a love of Moroccan mint tea. Like finding a passion for books later in life, I also really fell in love with tea later and the "art" of it, as Niles rightly referred to it. I think the first seeds were planted though as a young girl served tea in fine china along with a homemade fruit at a relative's house in Switzerland. It all seemed so elegant. Here, Moroccan mint tea from a day trip years ago to Tangier. The memory of it lasted longer than the few moments it took to drink it. Can you imagine if this was in a Styrofoam cup? Yes, there is an art, a beauty, in tea if you drink it properly. This fits in with French good living to me. I was saddened to hear of the closing of Pigalle in New York City where I share many a civilized lunch with a friend discussing those very things in Dandelion Wine. I'm so grateful to have e-mail to connect me with friends who live far, but how I miss conversation. My blog is probably outdated since most people want the pithiness of Instagram, just a quick photo and caption, or a few characters on twitter. So many people's blogs are on hiatus or retired, and I understand why, but I miss reading them and their musings on frugality, the thrift market, animal welfare, books, and so on. They were a conversation too in a way. I like to think mine is, or at least a diary of sorts. The apple tarte tatin at Pigalle, which followed a conversation on books, family, politics, and life. Farewell and thanks for all of the good meals. "I looked at the book lying on a table. Though not a great reader myself, I knew that those who were - even Nora - could grow testy when one came between them and their books." - Hanging Mary by Susan Higgenbotham, an engaging novel of Mary Surratt and the Lincoln assassination, a book I would have never found if not for it sitting on the library shelf nudging its way into my life. Isn't it funny how books find their way into our lives as people do? So much of what I have read has been because another reader passed their book on. Another part of my household downsizing campaign has been to drastically downsize my book collection, passing them on to charity resale shops. I used to be cheered by the sight of so many books in my home but now it's quite the opposite. I have kept some cherished favorites for now that I'd either like to share with Grace and Pearl or have my own sentimental reasons. Others I had every intention of reading but have sat on my shelf for too many years. I believe books are living things that should keep on telling their stories, which they can't do collecting dust on a shelf. In Seattle, a Little Free Library. If you love a book, set it free. "It is the hour of the pearl—the interval between day and night when time stops and examines itself." - John Steinbeck, Cannery Row. It is the hour of our Pearl, our June baby who is finally here born a few weeks ago to this very tired and absentee blogger. Her middle name, Elizabeth, chosen after my own mother. I liked the vintage appeal, beauty and simplicity of Pearl. I read it was a top 25 name in the late 1800s. Laura Ingalls Wilder, one of my favorite authors who wrote of her childhood in that era, had a sister, Grace Pearl. Soul searching for names had me thinking of the origin of my own name, Catherine, and I'd asked my mother in the past why she'd chosen it (in part because it was a name they would know in her native Switzerland). Do you know the origins of your name and why it was chosen? I wonder what passions of mine Pearl will love too? Only time will tell. Grace, our toddler, currently loves herbal tea, books and time in the garden, as do I. She has a favorite thyme plant she carries around, pictured below, and loves to smell all of the herbs. I'm already bringing the scents of herbs to Pearl's little nose. Will any of these imprints take? My mom remarked that while so many young children everywhere are glued to devices (I've even seen infants with a screen plopped in front of them), our daughter looks at the flowers and the sky for the moon, an interest of Steve's. I've never looked at the moon so much in my life since Grace started pointing it out, and she finds hearts everywhere. She's been my teacher on my path too, as Pearl will be. Whatever passions they pursue, I hope above all else they are lovers of life. Will they find beauty in simple things, like laundry drying in the sunshine? Baby laundry seems to me especially cheery. I was in the hospital for five days and had no television. Aside from not wanting to pay the $12 daily fee, I longed for the peace and quiet I recalled from my hospital stay when I had Grace. We were in our own little nest, a respite from election fatigue and the tabloid times we live in. With now two children to take care of, and as I recover from the birth which has forced my body to rest, I'm reminded of how precious my free time is and how I want to spend it in places that are good for my body and spirit, like the garden, and among great storytellers, or even just catching up on restorative sleep. I never spend time reading, outdoors or napping thinking that I'd wasted time. So much of my online time surfing seems like precious time gone forever. With the exception of watching a few favorite programs or films, television is often wasted time too. As I had to adjust my diet during pregnancy for a healthy baby and am trying to maintain it as I nurse, I'm on an internet and television diet too. I think of how Buck's character of Wang Lung always longed for the land. His soul seemed so dissatisfied when he was apart from it. My mom and I visited a local farm with Grace before I had Pearl, and after walking through the magical greenhouses, my mom remarked afterward that it was like going to church. Maybe that's why time in nature feels like a religious or spiritual experience. It's hard not to see the beauty and wonder of the world, even the holiness, everywhere....in words, in flowers, in my children's eyes. Do you see it everywhere? "Sometimes when Rose was reading, she would catch a whiff of the musty smell of her book. She put her nose down in the fold and inhaled deeply so that wonderful smell, the smell of adventure in faraway lands, would fill her up. She rubbed her hand across the pages to feel the velvety surface of the paper. When she closed her eyes, her fingertips could even feel the words that were printed there, each letter raised just a little, almost like the special language that her blind aunt Mary could read. My nearly two-year-old daughter Grace is fascinated with books. She often plucks my own books from my hands and flips through the pages as if trying to decipher a mystery. No fancy images, just words. There's magic in here, I tell her. I love the feel of a real book too, and the adventures they bring me on. How I miss traveling, I told my husband Steve, as we've taken day trip staycations with Grace for convenience and budgetary reasons the last two years. I miss those road trips, just being out there with the land, an almost religious experience. But I travel in time and space through the portal of books, and they invoke memories of past travels too. With all of the award season hoopla given to films and those who participate in them, I wish we had a public equivalent celebrating authors. Michael Punke, author of The Revenant, doesn't seem to get the glory Leonardo DiCaprio is receiving, even though he was the one who brought the story to life. As much as our society and politicians talk about education, it seems like we value materialism and sports far more than pursuits of intellectual betterment. For me, reading is an essential part of lifelong education. One of my favorite scenes in the film The Age of Adaline starring Blake Lively is when Adaline is being courted by Ellis and he says he is going to bring her flowers. He surprises her with a trio of books with flower names: White Oleander by Janet Finch, Daisy Miller by Henry James and Dandelion Wine by Ray Bradbury. When I looked up Dandelion Wine on Amazon, I noticed customers who purchased it also bought the other two. I guess I wasn't the only one smitten with this scene. The film was poorly reviewed by critics, but I loved the magical feel of it, the time travel, the fashion, the San Francisco setting, and of course the nod to books. I don't have a reading goal, just to have books, and the beauty of words, in my life, just as I want the beauty of nature to never escape my notice. I am including passages of favorite quotes from my year-end storytellers. Thank you storytellers, for bringing this magic into my life. "You may hate being pregnant, but the minute the baby is born, she is God's precious child, given to you as a gift." - A Quilt for Christmas by Sandra Dallas. A major reason I haven't been blogging, aside from caring for Grace, is I am expecting another daughter due in late May or early June. I've simply been too tired or not feeling well to get onto the computer to write, or when I'm not taking care of household matters, want to purse other interests in my free time when Grace is sleeping, like reading, of course. Tulips and bleeding hearts returning to my garden each spring. Isn't the miracle of life amazing? I cannot wait to meet the little soul that is growing inside me this winter, waiting for her spring. Walking along New York City's High Line. With all the craze over gym memberships, exercise equipment, DVDs and fad diets this time of year, isn't there something so wonderful in the simple beauty of just going for a walk? Not to mention it's free. I believe so firmly in the merits of walking, for body and mind. I can't resist including another quote from The Birth Year. "Full of the usual blights, mistakes, ruinous beetles and parasites, glorious for one week, bedraggled the next, my actual garden is always a mixed bag. As usual, it will fall far short of the imagined perfection. It is a chore. Hard work. I'll by turns aggressively weed and ignore it. The ground I tend sustains me in early summer, but the garden of the spirit is the place I go when the wind howls. This lush and fragrant expectation has a longer growing season than the plot of earth I'll hoe for the rest of the year. Raised in the mind's eye, nurtured by the faithful composting of orange rinds and tea leaves and ideas, it is finally the wintergarden that produces the true flowering, the saving vision." At the show of Mexican artist Frida Kahlo at the New York Botanical Garden this fall. We have a family membership here and also recently saw the holiday train show. I have such a euphoric feeling being here, and it's one of my favorite places in New York. With such a mild winter we've been experiencing thus far I know I have no right to be daydreaming about gardens so often, but I can't help myself. "Rose carefully and gently pushed the growing pile of rosy-golden apples around each time another crate was dumped into the wagon. 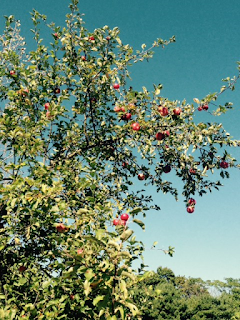 She waded carefully through the apples without lifting her feet, so she wouldn't step on a single one. Soon the whole wagon box was a sea of red and yellow, full almost to the top. She wanted to dive right in, it looked so inviting. She picked two of the reddest ones she could find, gave one to Mama, and they each took a bite. "Delicious," said Mama through a mouthful, the juice running down her chin. "If there were no other food in the world, I think I could live on apples alone." Hers was the sweetest apple Rose could ever remember eating.” - In the Land of the Big Red Apple by Roger Lea MacBride. Pictured above a bin of apples from an apple picking outing at Twin Star Orchards in New Paltz, New York. We took a day trip here in October and I am including some photos for memory's sake. Travel, even just an outing for a day, is on an equal level of books as a great passion and pleasure in life. I agree with their motto of "ugly apples taste better." Nothing is worse than a perfect looking red delicious apple from a supermarket. Give me an ugly apple any day. Wood fired pizza with apple cider, the smell of pine and apple wood burning in the air, an idyllic outdoor seating area away from the harried pace of modern life. There's so much to love here. Nothing fancy, nothing modern, nothing expensive. 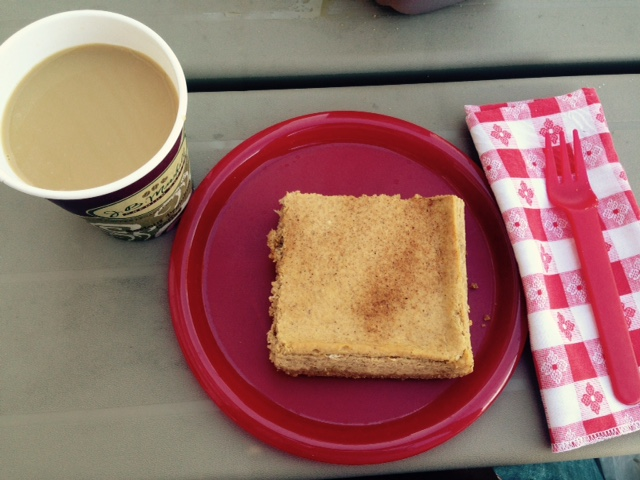 Just timeless, simple pleasures. In Muir Woods in California on our honeymoon. I believe in the magical and healing properties of the forest, for mind, body and spirit. An onion soup at Pigalle in New York City, an old lunch haunt when I worked in the city. I turned 40 this year and I look forward to all the days ahead granted to me. I'm thrilled if I make it to old age. "It's a great idea to analyze how screen time has changed your life and how it alters your behavior. If you don't like what you see, implement changes. Get comfortable again with real human connection and don't give so much power to the screen and what is behind it. Real life is in the present moment, happening right now. We never know how many days we have in front of us. Let's live them fully, not virtually." - Polish Your Poise with Madame Chic: Lessons in Everyday Elegance by Jennifer L. Scott, who also pens one of my favorite blogs, The Daily Connoisseur. Have you seen the Rashida Jones advertisements for Verizon? One features her visiting her mother who ignores her when she tells her daughter to turn off her Wi-Fi. Her mother cannot wait to sit down and look at her tablet. Another has Rashida running out on a friend on movie night since the film isn't downloading fast enough. Apparently conversation must be a thing of the past. The most recent has her mother and two others visiting Rashida and they get carried away on how fast her network is. She tries to engage in conversation over a hot drink, but everyone is glued to their devices. The ad ends, "Get out of the past. Get Fios." Meant to be humorous, these commercials do not leave me laughing. I want to run back into the past sometimes. While there's so much that is wonderful about technology, the anti-social behavior of teens and adults and the addiction to these devices is a serious matter. What values are corporate America selling us? No one was glassy-eyed, looking at their screens, scrolling mindlessly, when my mother brought over a homemade plum tart we enjoyed with coffee on the patio one warm day. The only tweets at that moment: birdsong. Wildflowers in Rainier National Park in Washington state. My mother introduced me to the beauty of flowers as I have childhood memories of her garden, and I remember my grandparents' garden in Switzerland too, with pictures of my grandmother and mother if front of their blooming geraniums and my grandfather standing by giant sunflowers. Our society is so materialistic and we so emphasis "stuff" and upgrading, but we forget about what can be most fulfilling to the soul. A courtyard in Santa Fe, New Mexico. I recall many of our travels fondly, and so often find my mind returning to the sacred, enchanting lands of the Southwest. That's what I love about travel, even if you are there for a short while, and maybe only once in your life, the memories linger far beyond. The same holds true for books. In Colorado, driving on the road from Durango into the mining town of Silverton. An oil spill caused by an EPA cleanup crew at a mine near Silverton has devastated the water supply, something we take for granted until it's tainted. Have we treated the mountains fairly in our nation's short history? Hardly. At the New York Botanical Garden, a reminder we must care for our earth. "Lincoln's heartbeat picked up a little, the way it always did when he rounded that last bend in the road and saw home waiting up ahead. Home to me always evokes happy thoughts of my husband, daughter, our two dogs, our wonderful neighbors, a place for a cup of tea, a comfortable bed, a fire on the patio, my cherished garden. A storyteller at the Ramapough Powwow. Whether in written or oral form, let the wonder of stories fill your life with a little magic. Goodreads is a favorite site to keep track of my reading lists (read and to-read) as well as quotes. I loved my storytellers and want to seek out more works by many of them, although Linda Lael Miller, whose books I read from library displays, isn't my cup of tea so I don't think I would read her again. Since we're a one-income family as I'm a stay-at-home mom, I'm using the library more than ever now, and we rarely see movies in theatres, enjoying the privacy and sanctuary of our own home and the frugality of free library DVDs. Better World Books, my favorite go-to online used book retailer for great prices, efforts to promote recycling (many books are library discards) and promoting literacy around the world. Frightful's Mountain, by Jean Craighead George, $2.50. Charlotte in New York by Joan MacPhail Knight, $4, a gift I bought for Grace's first birthday for her library. When Calls the Heart by Janette Oke, from The Well Read book store in Hawthorne, New Jersey, about $15. A sun-kissed peach at Demarest Farm in Hillsdale, New Jersey. In my opinion, more satisfying than the latest version of any iPhone. Canned peaches were a marvel to homesteader Mary Bee Cuddy in the Hillary Swank and Tommy Lee Jones film, The Homesman, portraying the harsh, isolating life on the Nebraska frontier in the 1800s. 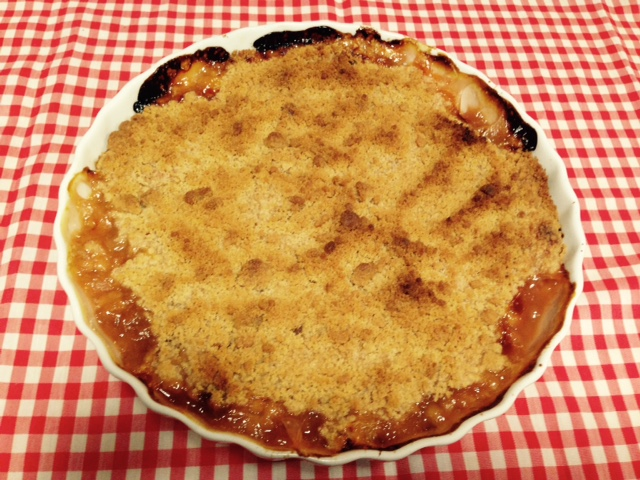 A peach pie was a taste of home back in the East, something a potential husband Mary Bee was trying to attract might find pleasing. In Isabel Allende's California gold rush novel, Daughter of Fortune, she wrote of the fortune seekers, "They would pay any price for the apple pie that gave them a moment's respite from homesickness." Whether it's the latter half of the 19th century or 2015, there's something so nourishing to the soul like a piece of pie, especially made at home or from a farm. 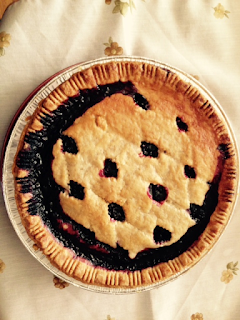 I feasted on a fresh blueberry pie this Columbus Day weekend purchased at Old Hook Farm in Emerson, New Jersey, which my sister described as very "Little House on the Prairie." I could see this on Caroline Ingalls' windowsill for cooling at Plum Creek. This is been made into another "sale" weekend, yet another excuse to go shopping and consume. Home Depot's advertisement had a banner "Take on Fall" and below it "Let's Get Upgraded." When I hear upgraded I always think, buy things you don't truly need. I'd take a piece of pie at the farm any day over time at the shopping mall. This is my take on fall. 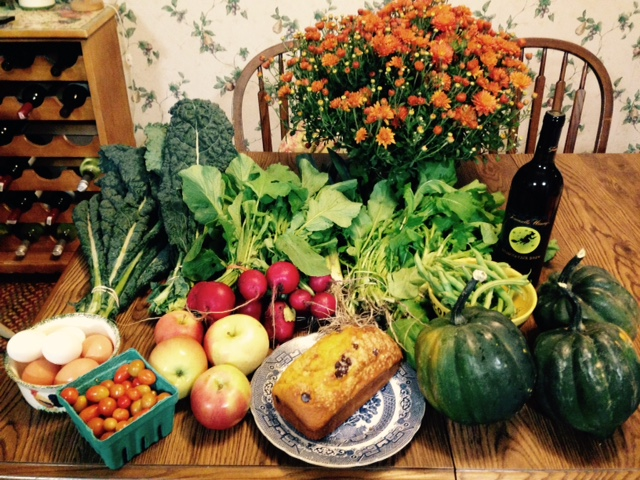 August was our first time peach picking, which we did at Demarest Farm. I ate more peach melba than I ever did in my life this summer. I adored too peaches for snacking and my husband Steve's peach crisp. I love the "Come back to the country" t-shirt worn by the driver of the tractor. I think as a nation we all need that, to turn away from our addiction to technology and come back to something more tangible. I keep thinking with the bombardment of pumpkin products each fall that seems to increase each year, do we really like pumpkin that much, or is it something pumpkin represents that we're longing for? In the BBC adaption of Flora Thompson's Lark Rise to Candleford, Laura Timmins describes, "The last few days of summer were a time of headiness and plenty....while the Lark Rise men brought home the harvest." Most of us in modern life have no part in harvesting. That can be a good and/or bad thing depending on your perspective. 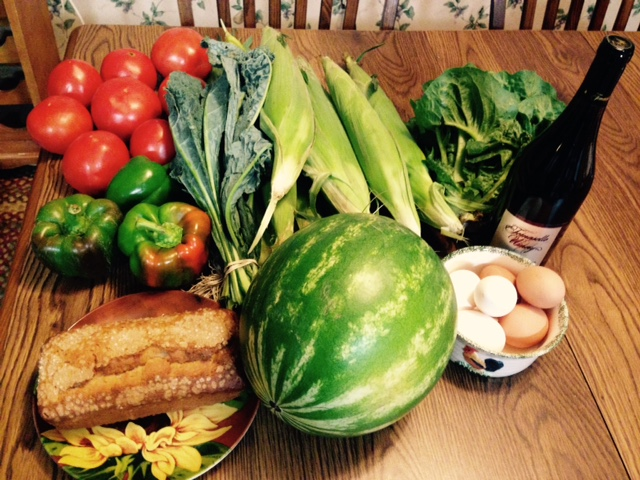 We're lucky and grateful to have farmers in our lives supplying the good and plenty. 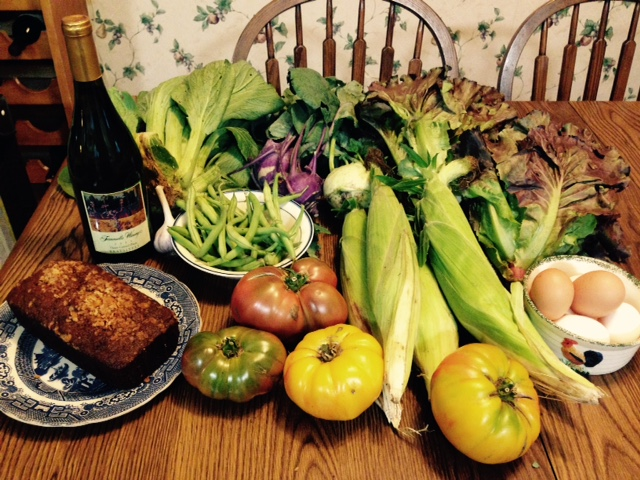 We loved the variety of our CSA with Abma's Farm in Wyckoff, New Jersey, produce plus add-ons of eggs, dessert bread and Tomasello wine. Here's an update of what we received. 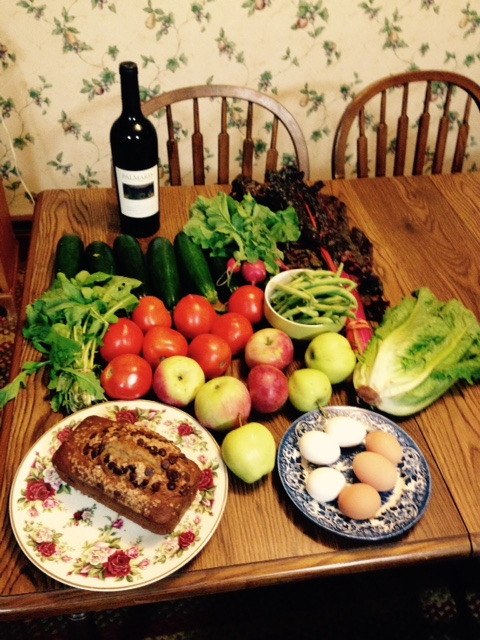 For 20 weeks, we paid, $440 for the produce, $40 for half a dozen eggs weekly, just under $300 for the wine and the bread, which I signed up for the third week, was a big splurge at $7.25 a loaf. So the weekly photos represented about $45 worth of food. Considering all the meals we got out of it, we considered it worth the cost. We could spend that much going out for one meal, which we rarely do anymore, save for farm lunches maybe once a week. We may just do produce and eggs next year, possibly bread. I really enjoyed trying the wines but am not a big drinker. 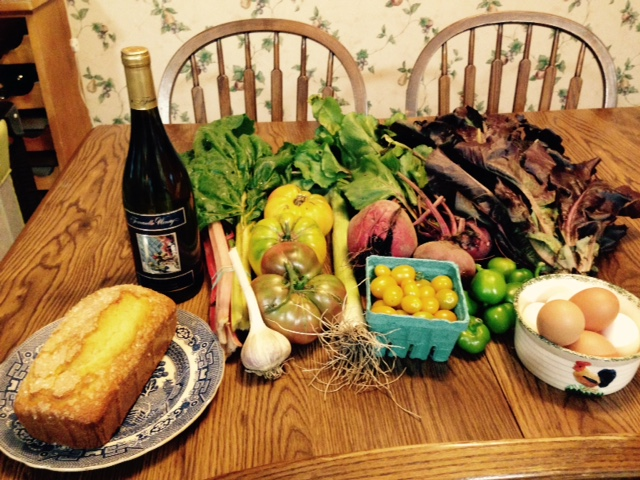 Week 12: Swiss chard, heirloom tomatoes, garlic, beets, leek, lettuce, cherry peppers, cherry tomato pints, with eggs, cornbread and chardonnay. I always took a mix of brown and white eggs and think of one of my favorite episodes of Little House on the Prairie, Country Girls, when Harriet Oleson tells Caroline that brown eggs are 4 cents less a dozen, which Caroline victoriously refutes. Week 13: Cubanelle peppers, carrots, corn, cherry tomatoes, plum tomatoes, lettuce, leek, with eggs, apple banana fusion bread (I swapped the offered zucchini bread to try a new one), and riesling. Week 14: Bok choy, kohlrabi, lettuce, corn, garlic, green beans, heirloom tomatoes, with eggs, Morning Glory bread (with carrots, coconut and raisins) and Rkatsiteli white wine. Week 15: Leek, Swiss chard, lettuce, bok choy, tomatoes, radishes, peppers, cherry tomatoes, with eggs, pumpkin bread and Autumn Leaf red wine. 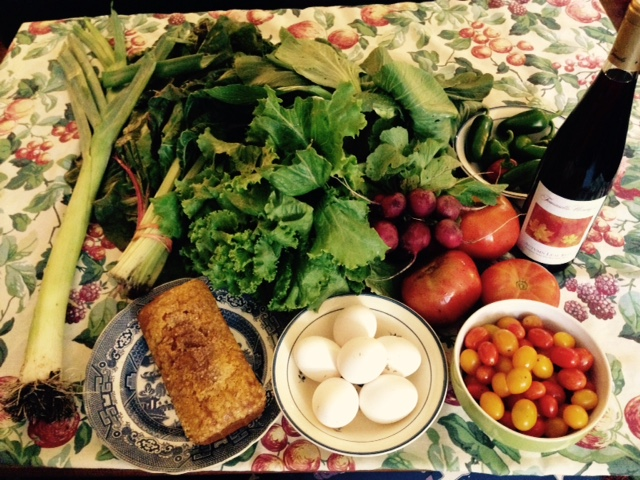 Week 16: Tomatoes, leek, corn, lettuce, bell peppers, and a watermelon from a Sussex County farmer, with eggs, apple cinnamon bread and pinot noir. Week 17: Tomatoes, zucchini, cucumber, collard greens, lettuce, arugula, and peaches from a fellow farmer, with eggs, cranberry bread and sangiovese, which went so well with baked ziti on chilly, rainy night. Week 18: Tomatoes, zucchini, green beans, Swiss chard, a head of lettuce, arugula, radishes, apples from Sunshine Orchards in Milton, New York, with eggs, banana chocolate chip bread and a cabernet reserve. 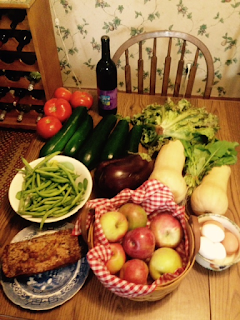 Week 19: Tomatoes, zucchini, green beans, eggplant, a head of lettuce, arugula, apples and butternut squash. 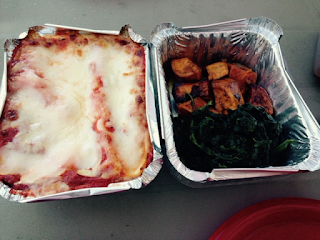 We had a choice of spaghetti, butternut or acorn squash. With eggs, zucchini walnut bread, and a vintage port. I cannot wait for butternut squash soup. I know pumpkin products get all the glory these days, but I love other fall fruits and vegetables equally: squashes, cranberries, pomegranates, apples and such. 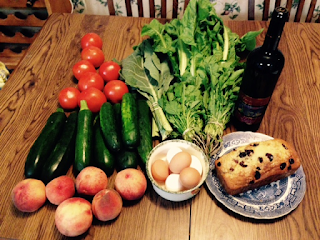 Week 20: Kale, arugula, radishes, a leek, green beans, acorn squash, cherry tomatoes, apples, with eggs and pumpkin chocolate chip bread, and a Broomstick Brew wine. Everyone got to pick out a mum: yellow, purple or orange. It was so sad picking this up for the last time! I celebrated the autumn equinox at Demarest Farm my mom and daughter Grace with an army of people who came for apple picking. We just came for lunch, sharing cheese lasagna, sweet potatoes and spinach, with pumpkin cheesecake and hazelnut coffee. There's a television ad for Campbell's with a young couple in the kitchen both glued to their handheld devices while eating dinner. The woman's foot softly touches his, and the announcer says, "Nothing like a good quick meal to bring two people together" and their meals are for "real, real life." So have we have all been reduced to not human beings but consumers, so mindlessly looking at our gadgets? While there's so many wonderful things about technology, I think these devices play too heavy a hand in our world, and they've become an actual extension of our body: arm, hand, iPhone. How can we appreciate our food while looking at a device? Nearby our lunch table was a group of teenage girls, each one with a phone in their hand that they were looking at the entire time we were there. I told my mother of my concern of raising our daughter amidst this mob mentality of phone dependency. I think of an exchange between characters on Lark Rise to Candleford, with Alf resistant to the machines that would soon change his world. I think we need to put the devices down and get back to savoring our food, interacting with one another, looking not down but at this beautiful world around us, and letting our minds run free instead of being distracted. What's happening now, especially a generation taken over by companies selling these devices and contracts, doesn't feel like progress in the least. When I completed the four seasons of Lark Rise to Candleford following the closely knit agricultural community in England in the late 1800s, I felt a longing for more, since it was a world I craved. I loved simple things about it, like all the tea times and meals on Dorcas Lane's fine green and white china. No one ignoring each other looking at their phones here. John Dagleish, who plays Alf Arless, said that now "Everything is kind of sound bites and newsflash and flashplay. Everything sort of bombards you. It was a much slower pace of life. People take their time over their thoughts, over their words. It's definitely a lost kind of innocence that they had. We're bombarded with so much information now that we've sort of lost a bit of our imagination maybe and that magic of living off the land and supporting each other." I think farms get so mobbed during the autumn because as a people we long to reconnect with the magic of living off the land, if at least for a little while. I always savor a slower pace of life when I lunch at the Abram Demaree farm stand in Closter, New Jersey. 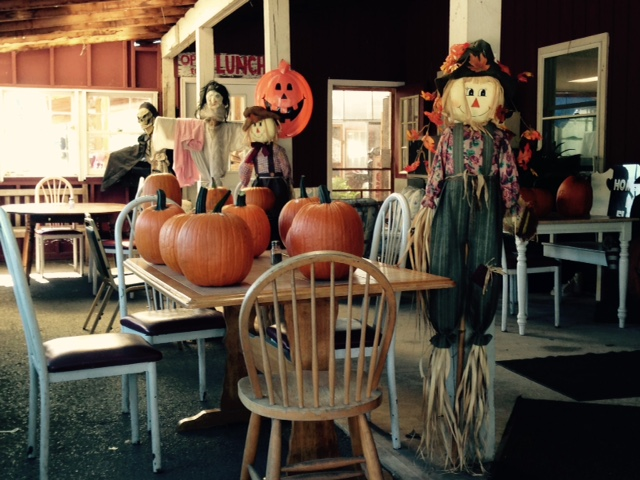 I always call this a bit of a secret farm, a hidden gem that serves up comfort food. 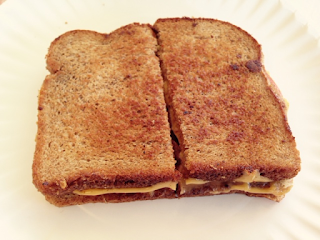 I was craving the simplicity of grilled cheese with tomato. Fresh out of the oven chocolate chip cookies. 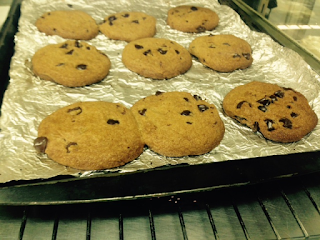 I've seen shows where they are trying to sell houses and they bake these at open houses to invoke the feeling of home. HGTV says "the intoxicating scent brings back childhood memories for many." For all the materialism in our society, isn't it so that things like simple gifts from our kitchens really pull at our heartstrings? 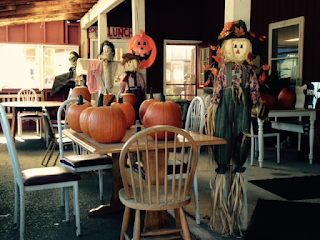 On the way home, we picked up the blueberry pie and apple cider at Old Hook Farm, where I admired the fall decorations. Isn't autumn the most cheerful, cozy time? I think like Scout, now called Jean Louise in her adult life in Got Set a Watchman, for many of us it's our best season. Movie Oro. Dog Cruelty. Alvin Yapan. Mark Shandii Bacolod. Friends for the Protection of Animals.